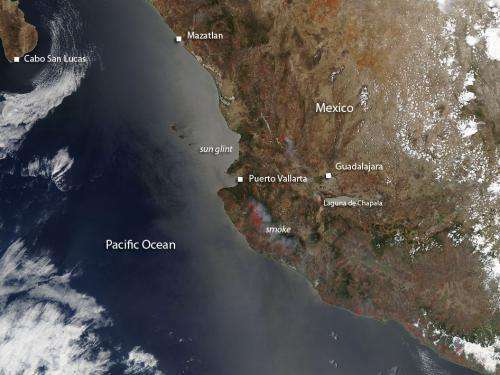 The Moderate Resolution Imaging Spectroradiometer (MODIS) on NASA's Aqua satellite detected dozens of fires burning in western Mexico on May 30, 2013. The fires are outlined in red. The location, widespread nature, and number of fires suggest that these fires were deliberately set to manage land. Farmers often use fire to return nutrients to the soil and to clear the ground of unwanted plants. While fire helps enhance crops and grasses for pasture, the fires also produce smoke that degrades air quality. Although the smoke hits hardest right around the area being burned, a fair amount of it drifts. News outlets in Texas, including NBC affiliate KCBD, report haze over the area and add "the smoke is prevalent from late March through early June. If smoke arrives here, it will likely affect those with respiratory conditions such as asthma."